In Forgotten God, Francis Chan discusses the mystery and importance of the Holy Spirit from a place of great reverence and humility. His servant heart brings forth a book full of approachable stories and illustrations, yet crystal clear in Biblical truth and classic Christian theology. His engaging style invites you into a conversation. You leave challenged but not condemned. Great for persons at all points in their journey of faith. A follow up to the profound message of Crazy Love, Pastor Francis Chan offers a compelling invitation to understand, embrace, and follow the Holy Spirit’s direction in our lives. Breakthrough author Francis Chan rips away paper and bows to get at the true source of the church’s power—the Holy Spirit. Chan contends that we’ve ignored the Spirit for far too long, and we are reaping the disastrous results. Thorough scriptural support and compelling narrative form Chan’s invitation to stop and remember the One we’ve forgotten, the Spirit of the living God. God created us so that the joy He has in Himself might be ours. God doesn’t simply think about Himself or talk to Himself. He enjoys Himself! He celebrates with infinite and eternal intensity the beauty of who He is as Father, Son, and Holy Spirit. And we’ve been created to join the party! All sorts of people are fond of repeating the Christian statement that “God is love.” But they seem not to notice that the words ‘God is love’ have no real meaning unless God contains at least two persons. Love is something that one person has for another person. If God was a single person, then before the world was made, He was not love. In the mutual relationship of the three persons of the Godhead we find the model for a human community. This relationship is characterized by kenosis and “inclusion”. Kenosis connotes the emptying, or total abandonment of oneself for a higher good, as with Jesus emptying himself for the glory of God and for the salvation of humanity (Phil. 2:5-11). “Inclusion” refers to the acceptance of others, joining them with oneself while honouring the diversity among the many, in a unity that does not seek uniformity. Holy God, One yet Three, reach into the abundance of Your companionship and bring forth unity and healing. Bring it forth in our land and all the nations of the world. Bring it forth in places of power and places of great need. Bring it forth in Your people. Pour out peace on violent homes and hearts. Shower compassion on selfish and short sighted motives. Rain down love and understanding so all are covered in Your blessing and harmony and life, forevermore…. forevermore. Amen. Prayer for Unity © 2012 Lisa Ann Moss Degrenia. You are welcome to use these works in a worship setting with proper attribution. Please contact Lisa for information and permission to publish these works in any form. Lisa is especially interested in collaborating with someone to set Comunity to music or to have her original tune for this lyric notated. For more information on use of the scripture, art and this post in other settings, please refer to the copyright information page. When the day of Pentecost had come, they were all together in one place. And suddenly from heaven there came a sound like the rush of a violent wind, and it filled the entire house where they were sitting. Divided tongues, as of fire, appeared among them, and a tongue rested on each of them. All of them were filled with the Holy Spirit and began to speak in other languages, as the Spirit gave them ability. Now there were devout Jews from every nation under heaven living in Jerusalem. And at this sound the crowd gathered and was bewildered, because each one heard them speaking in the native language of each. Other languages. Real languages. The disciples, who spoke Aramaic (and with an accent) suddenly were able to speak in other people’s languages. The true miracle and gift of Pentecost is not ecstatic prayer, but conveying love by bridging differences, by reaching out to the Other. Whatever separates us is the place where the miracle of Pentecost happens. 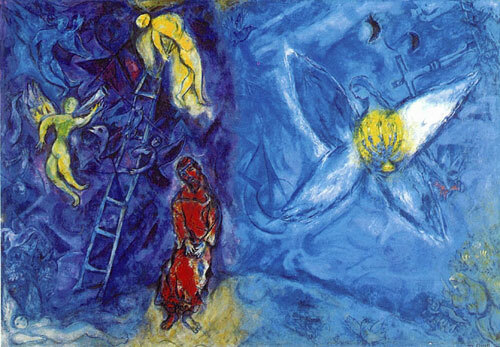 Pentecost is thus about the reversal of Babel. For the author of Luke-Acts, the coming of Jesus and the continuation of his presence in the power of the Spirit inaugurated a new age in which the fragmentation of humanity was overcome. Or, in words attributed to Paul, through Christ and the Spirit, the breaking down of “the dividing wall of separation” and the creation of “one new humanity” had begun (Ephesians 2:14-15). Sometimes people say that at Pentecost, God reversed the Tower of Babel, but that is exactly what He didn’t do. At Pentecost, God underlined the linguistic diversity that He introduced at Babel. Everyone in the crowd was able to understand the disciples speaking in his or her own language. The first miracle that the Holy Spirit did was to make it possible for the story of Jesus to be understood in many languages all at once. The Triune relational God did nor force conformity on his followers by making them all hear his message in one language, He encouraged diversity by allowing them to hear in their own language. From even before the Christian church was called Christian, it was multi-cultural and multi-lingual. 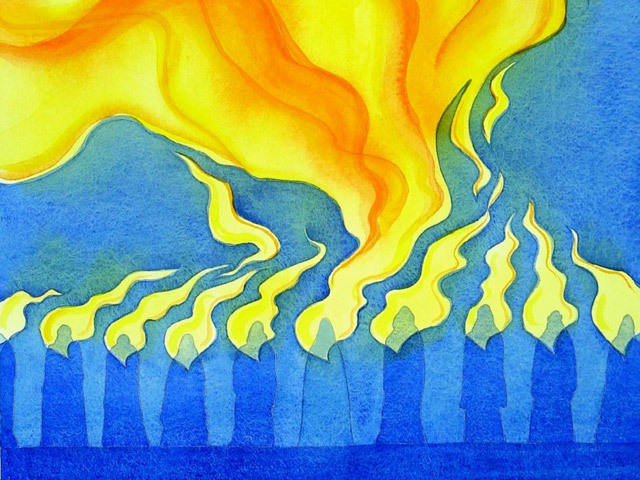 ‘disparted tongues’- that is, tongue-shaped, flame-like appearances, rising from a common center or root, and resting upon each of that large company – a beautiful visible symbol of the burning energy of the Spirit now descending in all His plenitude upon the Church, and about to pour itself through every tongue, and over every tribe of men under heaven! Therefore wait for me, says the Lord, for the day when I arise as a witness. For my decision is to gather nations, to assemble kingdoms, to pour out upon them my indignation, all the heat of my anger; for in the fire of my passion all the earth shall be consumed. At that time I will change the speech of the peoples to a pure speech, that all of them may call on the name of the Lord and serve him with one accord. Click Here for more about Soichi Wantanabe and his elegant and faithful work. For more information on the use of the art, scripture translation and this post in other settings, please refer to the copyright information page. 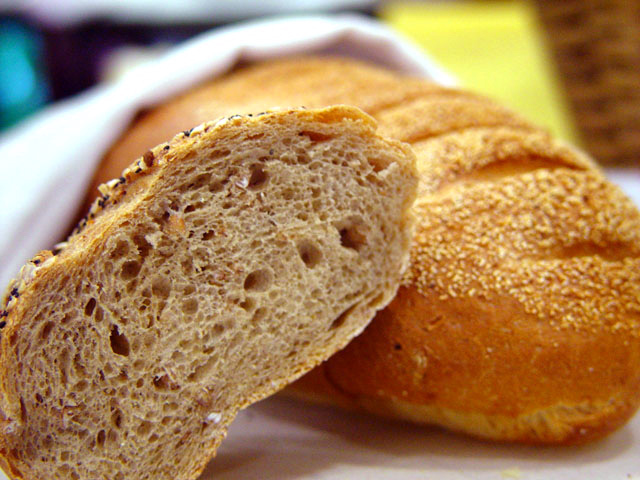 Bread by Think Draw via Wikimedia Commons. After he said this, Paul took some bread and gave thanks to God in front of them all. Then he broke it and began to eat. They were all encouraged and ate some food themselves. let this food to us be blessed, Amen. May all the world be clothed and fed. Amen. For friends and home we thank thee Lord. Lord Christ, we ask you to spread our table with your mercy. And may you bless with your gentle hands the good things you have given us. We know that whatever we have comes from your lavish heart, for all that is good comes from you. Thus whatever we eat, we should give thanks to you. And having received from your hands, let us give with equally generous hands to those who are poor, breaking bread and sharing our bread with them. For you have told us that whatever we give to the poor we give to you. Man Praying. Artist Unknown. Photo via Wikimedia Commons. There is a huge difference between believing what God has promised and praying for things you’d like to be true. I encourage you to pray confidently for what God has promised. Don’t put your hope in what others promise or what you’ve been told you’ll “get” if you are a “good Christian” (e.g., a good job, financial success, the perfect spouse, healthy children, a big house, etc.). And ultimately, you need to stake your faith in God alone, not in the gifts (good as they may be) that He gives. It really comes down to trust. Do you trust God that when He says no or “not in this way” to you, you still believe He is good and doing what is best? “You were here all the time, and I never knew it! The gate of heaven is everywhere. This is what I mean by the great democratization of God and the total accessibility and availability of God. God is as available and accessible as the very thing we all do constantly—breathe. All of our faults and ego possessions are just heavy and burdensome luggage that keep us from walking through the always-open gate—or even seeing it in the first place. It is one sacred universe, and we are all a part of it. The here and now has the power to become the gateway and the breakthrough point to the universal. Instrumental music continues under the Scripture reading. Instrumentalist transitions to the chorus of Surely the Presence of the Lord during the Scripture reading. Surely the Lord is in this place—and I did not know it! Fearfully How awesome is this place! So Jacob rose early in the morning, and he took the stone that he had put under his head and set it up for a pillar and poured oil on the top of it. He called that place Bethel; but the name of the city was Luz at the first. Then Jacob made a vow. If God will be with me, and will keep me in this way that I go, and will give me bread to eat and clothing to wear, so that I come again to my father’s house in peace, then the Lord shall be my God, and this stone, which I have set up for a pillar, shall be God’s house; and of all that you give me I will surely give one-tenth to you. We are Climbing Jacob’s Ladder, traditional Afro-American Spiritual. United Methodist Hymnal #418. Surely the Presence of the Lord, by Lanny Wolfe © 1977 Lanny Wolfe Music. United Methodist Hymnal #328. CCLI #7909. You are welcome to use this work in a worship setting with proper attribution. Contact the compilers for posting and publication considerations. For more information on the use of the music, scripture translation, art and this resource in other settings, please refer to the copyright information page.